As Damien McGrane took another step towards challenging for his second tour win and the perfect retirement present for his Australian caddie John Hort in his last event by getting to within four shots of Scottish pacesetter Chris Doak, Harrington added a 71 to his opening 70 to miss out on three under par. 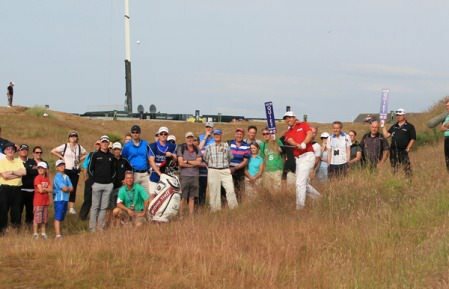 It’s not a total disaster for the Dubliner, who will get a chance to refamiliarise himself with Muirfield over the weekend should he decide to travel, but there are obvious issues to be addressed. Whatever about his driving, which was very wayward at times despite an improvement over day one, he looked utterly confused over which line to take on the greens at times. A tally of 62 putts for the first two days left Harrington 82nd for putts per round and 121st for putts per green in regulation, which are not the kind of figures that inspire confidence going into a major. Darren Clarke also missed the cut, despite getting to six under for the tournament with 11 holes to play. Four bogeys followed, three of them at par threes as he added a 72 to his opening 69. Peter Lawrie also missed out, weighed down by a first round 77 that left him too much to do. A one over 71 saw him finish eight shots from safety on four over. Damien McGrane putts in the second round at Castle Stuart Golf Links. 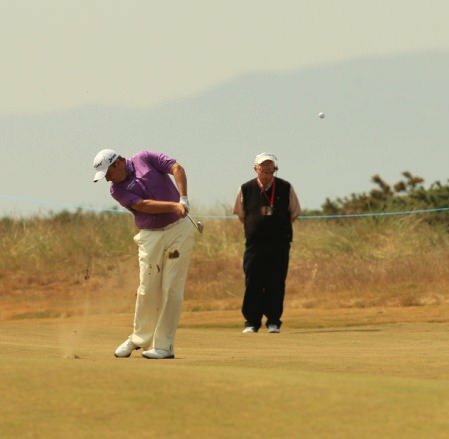 Picture Stuart Adams www.golftourimages.comAt the other end of the leaderboard, McGrane overcame some tricky breezes, tight pin positions and firm greens to card a satisfying, three under 69 that left him tied for 13th on eight under. “It was good,” the Kells man told European Tour Radio’s Nick Dye. “I played lovely again today. Gave myself some opportunities. The pins were quite tight out there today and there were a couple of firm greens and tight pin positions. “I thought they were easier than they really were and I ended up struggling for pars on on some holes where I thought I would have birdie opportunities. I played lovely again today and I am really satisfied. “From the first tee box today there was a good breeze. It has warmed up now so it is not as stiff but we couldn’t get near 18 in two for argument’s sake. But it is all about hanging in there. “I kept making pars, kept horse-shoeing out for birdie and then made three in a row, so that was sweet, in the middle of the back nine. So three under is a good score for the day that is in it. Doak shot a second successive 66 to lead by a stroke on 12 under from Ross Fisher, Matthew Southgaete, JB Hansen and Peter Uihlein. The 35 year old, who has just a single top ten finish to his name on The European Tour, lost his card in 2009 but returned to the top tier last year courtesy of a tenth place finish in the Challenge Tour Rankings. “It’s absolutely phenomenal to shoot 66-66 in the first two days,” he said. “You start the week thinking you want to go low, but to actually do it is fantastic. “I feel it has been coming all year, but just maybe haven’t put it all together. These two days, I’ve definitely put it together. damien McGrane’s caddie, John Hort, who retires at the end of this week. Picture Stuart Adams www.golftourimages.comUihlein’s compatriot Phil Mickelson enters the weekend four strokes off the pace after an up-and-down round of 70. 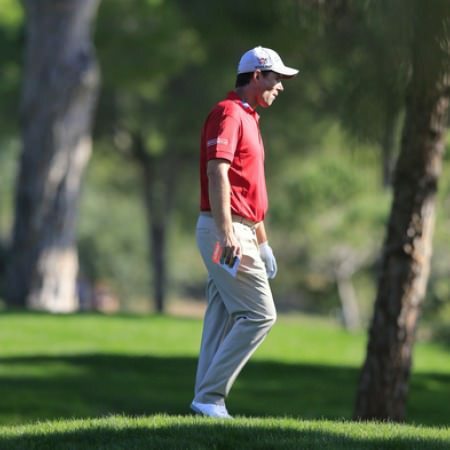 Two under starting the day, Harrington got off to a slow start with five straight pars before following a birdie four at the sixth with bogeys at the eight and ninth. He needed too shoot three under on the back nine but while he birdied the 12th and 14th, he came to the par-five 18th needing a four but walked off with a par and out of the tournament alongside Clarke, Simon Thornton (69-72), Michael Hoey (74-69), David Higgins (71-74) and Peter Lawrie (77-71). Three bogeys and a double bogey seven at the sixth saw Shane Lowry follow his 66 with a 73 to retreat into the pack and share 46th on five under with Paul McGinley (67-72) and Gareth Maybin (69-70).